Join us in celebrating the leadership and work of Professor and award-winning filmmaker Manthia Diawara at a reception and screening of An Opera of the World. On September 19th we honor and say thank you to Manthia Diawara for his years of dedicated service and vision for the Institute of African American Affairs. Professor Diawara’s film, An Opera of the World (2017, 70 min, DCP), is based on the African opera Bintou Were, a Sahel Opera, which recounts an eternal migration drama. The Bintou Were opera, filmed on location in Bamako, Mali in 2007, serves as a mirror for Dr. Diawara to build an aesthetic and reflexive story, through song and dance, about the current and yet timeless drama of migration between North and South, and the ongoing refugee crises. The film ponders on the realities of cultural encounters through the concepts of métissage and hybridity. Written by Chadian poet Koulsy Lamko, it tells the story of a young mother desperately attempting to make her way to a better future for herself and her unborn. Professor Diawara masterfully interweaves stories of migration and crisis in Syria and Mali today. The success and limits of fusing African and European perspectives are tested by interlacing performances from the Bintou Were opera, past and present archival footage of migrations, classic European arias, and interviews with European and African intellectuals, artists and social activists – including Alexander Kluge, Fatou Diome, Nicole Lapierre and Richard Sennett. Co-sponsored with the Office of the Dean, Tisch School of the Arts. 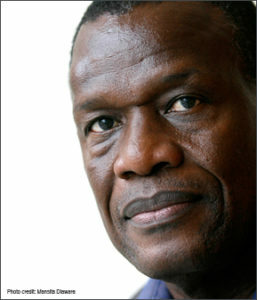 Manthia Diawara is a writer, cultural theorist, film director, and scholar. He is Professor of Comparative Literature and Cinema Studies at New York University and is director emeritus of the Institute of African American Affairs. Born in Mali’s capital Bamako, Manthia Diawara spent his youth in Guinea until 1964 when his family was expelled from the country by the regime of Ahmed Sékou Touré. While attending school in Bamako, Diawara became involved in a student group called “The Rockers” and began listening to music by James Brown, Wilson Pickett, Otis Redding, and Ike and Tina Turner. The group was opposed to the Vietnam War and apartheid and aligned itself with Black Power, the Black Panthers, and the Black Muslims. Diawara went on to study literature in France and subsequently moved to the United States, where he completed his doctorate at Indiana University in 1985. He then taught at the University of California at Santa Barbara and the University of Pennsylvania, establishing the Africana Studies Program at NYU in 1992. In addition to founding the journal Black Renaissance Noire, Diawara has written extensively on the films and literature of the Black Diaspora. His essays on art, cinema and politics have appeared in The New Times Magazine, LA Times, Libération, Mediapart and Artforum. He is the author of African Cinema: Politics and Culture, Black American Cinema: Aesthetics and Spectatorship, In Search of Africa, We Won’t Budge: An African Exile in the World, and African Film: New Forms of Aesthetics and Politics.